Baytown, Texas, was created for one reason, and one reason only: the drilling and processing of oil. Before the discovery of this “cash crop” in Goose Creek field in 1916, this area, located 30 miles east of Houston, was isolated and relatively uninhabited. The small town of Goose Creek, which had been founded in the first decade of the 20th century, had only 300 people before wildcatters began to drill for oil in 1915. After the successful oil strike the following year, settlement in the area exploded. One of the companies that sought its fortune in the Oil Creek field was the Humble Oil and Refinery Company, which would later merge with Standard Oil of New Jersey to create Exxon. Humble built a refinery close to the oil field in 1919, calling the site “Baytown.” At first, the town was just tents and shacks that sheltered the refinery construction workers, but the Humble Oil Company soon laid out streets and sold lots to its workers. The population of Goose Creek, nearby Pelley, and the unincorporated Baytown skyrocketed as people flocked to the area to work in the booming oil industry. In their wake came a handful of recent Jewish immigrants who opened stores catering to the growing population and began a Jewish community that lasts today. In 1917, Goose Creek, Pelley and Baytown, known informally as the “Tri-Cities” had 2,000 people and only two Jewish families. By 1920, 20 Jewish families called the Tri-Cities home. Among these early Jewish settlers were recent Russian immigrants Ira Guberman, who opened a dry goods store in Goose Creek by 1920, and Alexander Grenader, who owned a grocery store. Many of these early settlers had moved to the area from nearby Houston. In 1948, the Tri-Cities merged and were officially incorporated as “Baytown. 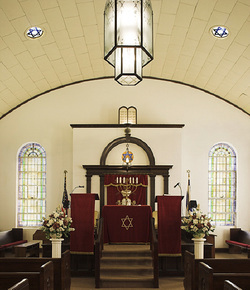 By the 1920s, Jews in the Tri-Cities had begun to worship together informally, even renting a space to hold Shabbat services on Friday nights and Saturday mornings. In 1928, the group was officially chartered as Congregation K’nesseth Israel (Assembly of Israel) with 20 founding members. Of the 18 members who could be found in the 1930 census, 16, or 83%, were foreign born; all of these immigrants were from Russia or other parts of Eastern Europe. Most had been in the United States for several years; their average year of immigration was 1910. All of the founding members were business owners, with most owing dry goods or grocery stores. They were middle-aged and middle class. Their average age was 41, while over 75% of them owned their own home, with an average value of $2900. Most of the members, almost two-thirds, lived in Goose Creek, while a handful lived in Pelley and unincorporated Baytown. Since most members were successful business owners, it was not unreasonable for them to discuss constructing a synagogue for their new congregation. Some members were concerned that since the Tri-Cities had grown so quickly, that the prosperity of the area might not last. Others argued that the Humble refinery would ensure long-term growth in the congregation and the economic stability of their community into the future. The optimists carried the day as a majority supported the plan to build a synagogue. The building fund committee quickly raised $5000, and borrowed the rest. The congregation bought two lots from Humble Oil’s founder, Ross Sterling, and began to build a house of worship. Completed in 1930, the modest yet beautiful brick synagogue was supplemented with a separate community hall on the same property. 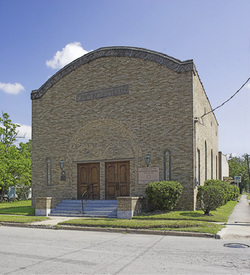 In 1992, the synagogue was named a Texas Historic Landmark for its unique architectural design. K’nesseth Israel was a nominally Orthodox congregation, though traditional Jewish law was not strictly enforced. While generally men sat separate from the women, a few families sat together. Since most members owned retail businesses, they had to keep their stores open on Saturdays, the traditional day of rest. Thus the group worshiped together early Saturday morning, and then went to open their stores. According to one longtime member, services were held early on Friday nights so members could attend the local high school football game. Despite these compromises, members would close their stores for the High Holidays, including the traditional two days for Rosh Hashanah. K’nesseth Israel had a series of Orthodox rabbis in its early years, including Ronlee Gray and later Benjamin Wade, who led the congregation in the 1930s. They were followed by Benjamin Danziger and Samuel Schwartz in the 1940s. These rabbis also ran the weekday afternoon cheder for boys. The congregation also had a Sunday school that met in the community building, which had been enlarged in 1948. When Rabbi Schwartz left for Houston in 1950, K’nesseth Israel relied on lay leaders like Pincus Goldfield and Harry Rothkopf to lead Shabbat services. With no rabbi to teach the children Hebrew, most families took their children to Houston for Sunday school by the 1950s. Many K’nesseth Israel members also joined congregations in Houston, and would usually go there for the High Holidays. In addition to the congregation, Jews in the Tri-Cities established other Jewish organizations. Even before local Jews officially formed a congregation, a group of Jewish women established a chapter of Hadassah, which raised money to support the Jewish settlement in Palestine and sponsored Jewish educational programs. After the founding of K’nesseth Israel, the chapter also functioned as a congregation Sisterhood. Most all of the Jewish women in the area belonged to the Tri-Cities chapter. In 1939, men established a B’nai B’rith Lodge. Though it never had more than 30 members, the lodge remained active for over 40 years before disbanding in the 1980s. By 1937, 125 Jews lived in Goose Creek. Despite this small population, Tri-City Jews, led by Mose Sumner, established the United Jewish Charities in the 1940s to coordinate fundraising for regional and international Jewish causes. Photo courtesy of Lynn Paine Shapiro. Jews dominated the retail business in the Tri-Cities. The five Aron brothers all owned stores in the area by the 1920s. Esidor Aron started out as a tailor, making suits for oil field workers, before opening a men’s clothing store in Goose Creek. Dave Aron also owned a clothing store, and was involved in local politics, serving a term as a city councilman. Sol Aron owned the Grand Leader Dry Goods Store in Goose Creek. Abe Rosenzweig opened the Economy Clothing Store in 1927, when he was only 20 years old, and remained in business for 42 years. 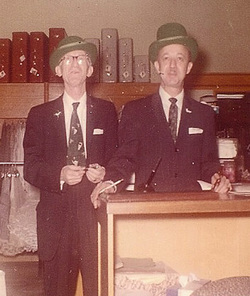 Brothers Mose Sumner and Joe Susnitsky owned the Sumner Dry Goods Store; they sold the business in 1945 to another set of brothers, Leon, Henry and Sam Paine. The Paine Brothers men’s and women’s clothing store remained in operation until 1977. Women often played an active role in these businesses. Morris Wilkenfeld opened his furniture store in 1926. Even after he and his family moved to Houston, Wilkenfeld continued to commute to Baytown to run the business. After he died in 1982, his wife Beatrice ran the business until her death in 1998. Their daughter Sharon continued to operate Wilkenfeld Furniture until it closed in 2006. When Isadore Wiener died in 1944, his wife Dora ran Wiener’s Dry Goods for many years afterward. While he started selling only men’s clothes, Max Altman soon opened a ladies department and bridal shop managed by his wife Natalie. Not all Baytown Jews were involved in retail trade. A sizable minority worked in the local oil and petrochemical industry. Julius Fram, Max Mosesman, and Herschel Karchmer were all chemical engineers for the Humble Oil Company. Donald Teter worked for many years as an engineer at a synthetic rubber plant. Several others worked for oil companies, usually as scientists or engineers. In the early years of the Tri-Cities, life could be rough and tumble. The Ku Klux Klan attracted a significant following amongst the oil field workers in the 1920s. One day a group of Klan members began to gather outside the home of Elias and Yetta Hochman, two Jewish immigrants from Galicia. As the family grew frightened, Yetta went outside carrying an American flag and a frying pan, and hit one of the Klan members over the head with the heavy skillet, threatening the rest with her shotgun if they did not leave her property. After the group dispersed, the man she hit filed charges against her. The judge ruled in Hochman’s favor, arguing that she was only defending herself and her family. Despite the brief prominence of the Klan in the 1920s, Jews were generally accepted into the civic life of Baytown. Jews were very active in the local community. Mose Sumner served as vice president of Citizens National Bank, and was a major booster of Robert E. Lee High School’s football team. helped many local kids go to college, and was named “Baytown’s Most Beloved Citizen” in 1950. In recent decades, Mervin Rosenbaum served as chairman of the Goose Creek Stream Development Committee and a local beautification association, while his wife Jean has been chairman of the board for the Sterling Public Library. Don Teter has helped to found local centers to help the mentally ill and those with developmental disabilities. His wife Gertrude spent many years working in the Counseling Center at Lee College; after she retired the center was renamed in her honor. K’nesseth Israel remained vibrant into the 1950s and 60s. Its Orthodox services were still in Hebrew. In 1978, the congregation celebrated its 50th anniversary, with services led by Rabbi Jimmy Kessler of Galveston, whose grandparents had been among the founders of K’nesseth Israel. The congregation eventually adopted the Conservative prayer book, though K’nesseth Israel has never belonged to any national Jewish movement. In recent decades, K’nesseth Israel and the Baytown Jewish community have begun to shrink. With the booming metropolis of Houston just 30 miles away, several Jews with businesses in Baytown moved to the big city and commuted. Most of the Jewish children raised in Baytown during the “baby boom” generation moved away to larger cities. When many of Baytown’s Jewish merchants retired, they moved to Houston to be closer to their children or a larger Jewish community. Baytown has endured a high degree of turnover in its Jewish population. According to Don Teter, 153 different Jewish families lived in Baytown at some point between 1928 and 2008, though never much more than 50 at any one time. By the 1980s, the attendance at regular services was very low at K’nesseth Israel. While a new group of young members revitalized the congregation for a while, the decline has continued in recent decades. The congregation benefited financially by leasing part of their vacant property to a local cable company, which helped them meet their expenses for 15 years. K’nesseth Israel still meets once a month for lay-led Shabbat services, which are now drawn from the Reform prayer book. K’nesseth Israel had only 18 members and fewer than 50 Jews still lived in Baytown by 2008. That same year, the local United Jewish Charities organization disbanded and donated its remaining funds to the national United Jewish Communities. Despite this decline, the members of K’nesseth Israel are still hopeful for the future. The drop in Baytown’s Jewish population has occurred while the city itself has grown from 21,000 people in 1948 to an estimated 78,000 in 2006. While the days of Jewish-owned stores lining Baytown’s downtown streets are long gone, there is still opportunity for Jewish professionals like doctors, lawyers, and engineers. In the end, Baytown’s proximity to Houston and its 45,000 Jews and 24 congregations will prove to be the biggest challenge to its future survival as a distinct Jewish community.